Three national corporate sponsors of Make-A-Wish are coming together to support the organization that grants life-changing wishes for children with critical illnesses. Mattel, Toys"R"Us and WWE are partnering to launch a new John Cena action figure – available exclusively at Toys"R"Us stores nationwide beginning Tuesday, August 15. The presale for the limited-edition collectible began July 11, online at Toysrus.com. For every purchase of the action figure, Mattel will donate a portion of the proceeds to Make-A-Wish to support the wish granting efforts of the organization. 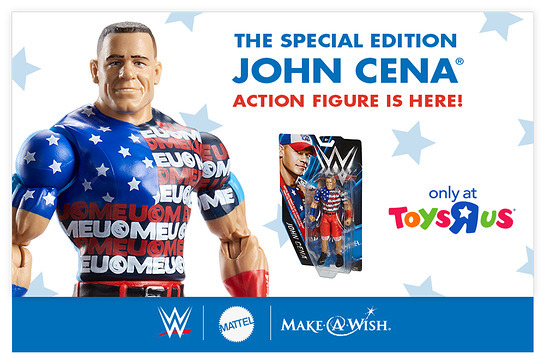 The figure features John Cena looking match-ready in red, white and blue, stars-and-stripes ring gear. The patriotic color scheme is the result of input from Alex, a Make-A-Wish kid from Los Angeles, Calif. Alex worked with the teams at Mattel and WWE to put his personal design on the new action figure. Alex is an example of the hundreds of wish kids who have wished to meet John Cena and have been forever changed as a result. Having granted more than 500 wishes to date, Cena is the most popular celebrity wish granter in Make-A-Wish history. In conjunction with the pre-sale of the action figure, now through Monday, July 31, Toys"R"Us will host a social media fundraising initiative benefitting Make-A-Wish America. For every retweet or share of the retailer’s #GivingIsAwesome posts, the company will donate $1 to the organization, up to $25,000. Another fundraising opportunity will come in late August when five John Cena autographed action figures will be auctioned off to the public on eBay with 100% of revenue generated through the auction benefitting Make-A-Wish. Mattel, Toys"R"Us and WWE each have a longstanding history with Make-A-Wish as corporate sponsors on a local and national level. Mattel, a national sponsor since 2007, has donated thousands of toys for wish activities and developed co-branded toy items with some of its most popular brands like Hot Wheels and Barbie. Toys"R"Us regularly donates toys and gift cards for shopping sprees in addition to providing annual grants from the Toys"R"Us Children’s Fund – leading to more than $3.5 million in donations in nearly 20 years. 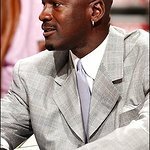 In addition to providing monetary support, WWE has granted thousands of wishes to meet Superstars as well as donated event tickets since the early 1980s. To learn more about this unique collaboration and find out how to make more wishes possible, visit www.wish.org/JohnCenaFigure.